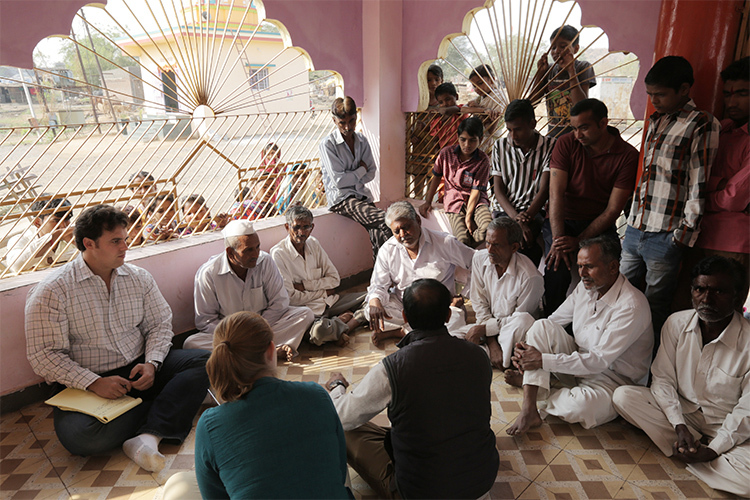 Tata Fellow Natasha Wright and Tata faculty Amos Winter’s research in India is featured in the award-winning documentary. On June 24, Boston-area journalists, videographers, and producers filled the halls of the Marriott Boston Copley Place for the 40th annual New England Emmy Awards. MechE’s multimedia specialist John Freidah was honored with a New England Emmy in the Health/Science Program/Special category for the film “Water is Life,” which chronicles Tata Fellow and PhD student Natasha Wright and Tata faculty Amos Winter as they travel to India gathering research on how to design a low-cost desalination system for use in developing areas. As the camera pans over an aerial shot of a lake in India, a flock of white birds majestically flies by. Capturing this moment in the opening shot of “Water is Life” required a lot of patience and a little help from a new friend. Unable to bring a drone into India, the film’s producer, editor, and cinematographer, John Freidah, had to come up with another plan. During a conversation on a flight from Delhi to Hyderabad, Freidah befriended a passenger in his row. He mentioned his search for a drone operator to get the perfect birds-eye-view shot of India’s landscape. As luck would have it, the day before departing India, Freidah received an email from his new friend saying he knew someone with a drone that he could use to film sweeping aerial shots. Planning for “Water is Life” began months before Freidah flew to India, however. Interested in highlighting the important work done in Amos Winter’s Global Engineering and Research (GEAR) Lab, Freidah and his colleagues in the media team at MechE honed in on the research Ph.D. student and Tata Fellow Natasha Wright was conducting on designing an affordable desalination system for use in rural India. With the generous support of Robert Stoner, deputy director of the MIT Energy Initiative and director of the Tata Center for Technology and Design, plans were arranged to film Winter and Wright in India. Visiting these villages and talking to end-users who would benefit from and potentially use a desalination system was a crucial component of Winter and Wright’s research. Capturing the daily challenges these villagers face on film brought another level of exposure to the work being done by GEAR and the Tata Center. “Having John travel to India enabled us to tell the story of our research in much greater depth than we could on campus,” says Winter. By capturing the many angles of Winter and Wright’s story, “Water Is Life” aims to show people first-hand what a problem access to clean water is on a global scale, and how essential it is to support new research and technologies that hope to solve it. The film was also recently honored with a 2017 National Edward R. Murrow Award — one of the most prestigious awards in journalism — as well as a 2017 Circle of Excellence Award from The Council for Advancement and Support of Education (CASE). Read the full story on MIT News. Photos and video by John Freidah/MIT.